I went into Arabia (Gal 1:17b). To Arabia, but to what part? To Mount Sinai, to the Red Sea, and to the city of Petra, a tour of salvation history, for God through his grace equipped Paul to be the Ambassador for Christ. To prepare himself, Paul spent forty days and forty nights in the desert in imitation of the Lord, and of his people, the Israelites, who God purified during their forty-year wandering in the Desert of Sin as he led them through the wilderness to Sinai, the mountain of grace. To Paul, a slave of Christ Jesus by the will of God, Sinai was a mountain in Arabia (Gal 4:25), the site where God handed down to his people through the prophet Moses the Decalogue, the Word of God intended to form the spirit of a nation through which the Messiah would enter the world. The conversion of Saint Paul on the road to Damascus is one of the most famous stories in the New Testament. What happened to Paul immediately after the Revelation is one of the Church’s greatest mysteries. In his Letter to Galatians the saint writes how he fled the city to enter the wilderness for a period of discernment, focused and intense, to understand the work that God called him to do¾his mission at baptism to become the Ambassador for Christ. This period, as short as it was, was one of the most important moments in Christianity, the transformation of the Apostle, from Saul the zealous Pharisee to the Paul the prophet of the new and reconstituted Israel, upon which depended the conversion of the western world. Immediately following baptism (Acts 9:18b) the Spirit led Paul into the desert and he journeyed to Sinai, communicating with the spirits of Moses and Elijah. Through the waters of Baptism–Noah and the flood, the liberation by God of the Israelites at the Red Sea—Paul assumed his role as the prophet of the New Israel, the Church, called before birth as he was like Isaiah and Jeremiah the prophets. It was in Petra, the capital of the Nabataean empire, that Paul first evangelized, for the Word awaited him among the Arabs (Acts2:11); he had only to open his mouth and proclaim Jesus. Jerome and Chrysostom said that Paul’s preaching in the court of Aretas IV the Arabian king was unsuccessful; nevertheless Aretas was moved. He put a price on Paul’s head (see 2 Cor 11:32) and he hastened to return to Damascus to join his Christian brothers and sisters but not before he returned to Sinai and, with the intercession of Elijah, took the desert road back to Damascus and entered the city with the spirit and the power of Elijah. In the agora at dawn the New Testament prophet made the greatest decision of his life, to forsake his role as emissary of the high priest and to respond to his vocation to be the Ambassador for Christ. “At once he entered the synagogue and preached Christ crucified and rise” (Acts 9:20). And all who heard him were amazed. In the beginning it was not so. Saul, the zealous Pharisee, persecuted the Church. He was known as the Messenger of Satan. Members of the Way, the Christian communities at Jerusalem and throughout the Decapolis, feared the name of Saul the zealous Pharisee. He was the agent of annihilation who wanted to destroy the Church in Jerusalem. So enraged was he against the holy ones that he pursued them to foreign cities (Acts 26:11), to run them down, arrest them, and to send them back to Jerusalem in chains to stand trial before the Jewish high court. This, he believed, was his calling, his responsibility to his nation. In Jerusalem, the holy city, Saul orchestrated a campaign of persecution against the disciples in the synagogues and in their homes. Entering house after house and dragging men and woman into the streets, he handed them over for imprisonment (Acts 8:3). In his mind he was acting in the tradition of his biblical heroes from the Old Testament: Phinehas, who slew a fellow Hebrew for consorting with a Midianite woman (Nm 25:6-15); Elijah the prophet, zealous for God against the priests of Baal (1 Kgs); and the Brothers Maccabees, martyred for defending the Law against the Greek invaders. As part of that tradition, Saul rose to the defense of the Law and the temple against the cult of the Nazorean. For his loyalty he was made a representative of the high priest. In Jericho Saul and his cohorts raided a house based on intelligence that Peter, James, and John were there. An apocryphal letter from Peter to James  illuminates his interior madness that he externalized against the Christians. Saul and his companions infiltrated the sacred space of the Church and condemned her saints. “Why are you bewitched by the words of this false prophet from Nazareth?” Saul cried. A priest of the Church stood up to Saul, but the Pharisee beat him down. The intelligence on which they based their raid was faulty—the apostles were not there. Saul turned to his soldiers. “What are you waiting for? Why do you not lay hands on these men and women?” He seized a firebrand from the hearth and struck at everyone within reach. Chaos erupted in the small room and much blood was spilled. In the confrontation Saul grabbed the priest and hurled him down the stairs. Leaving the man for dead, Saul and his soldiers arrested the disciples and sent them to Jerusalem to stand trial before the Sanhedrin on charges of blasphemy against Moses, the Law, and the temple, the same charges levied against Stephen the deacon, who, liked a lamb led to the slaughter, opened not his mouth in his own defense and was stoned to death (Is 53:7; Acts 7:54-60). In fact, he prayed for his persecutors. At sunset in Damascus, Ananias the priest received a report of what happened in Jericho and the Damascene community spent the night in prayer for the souls of the martyrs and those imprisoned. And they prayed for Saul and his stormtroopers, as had Stephen—“Lord, do not hold this sin against them” (Acts7: 60b; 8:1)—the truth they learned from the Lord who forgave his torturers as he hung upon the cross (Lk 23:34). In days gone by, Jesus’s disciples stood around the base of the mountain when he delivered the law of the gospel. “Love your enemies, and pray for those who persecute you, that you may be children of your heavenly Father, who makes his sun rise on the bad and the good, and causes the rain to fall on the just and the unjust” (Mt 5:44-45). The wind and rain buffeted the house of God but its gates remained secure against the powers of hell. Through the power of Peter and the Word of God the Church grew stronger and every day men and women received baptism, living stones in the foundation of the city of God. Then Gamaliel the saintly temple leader and legal scholar—one of a caucus of Pharisees who believed in Jesus—sent word to Ananias that Saul his former pupil was on his way to Damascus and that he bore letters to the synagogues in Damascus authorizing him to continue his unholy reign. Arriving from Jericho, he went down to the plain of Damascus at the time of the harvest. He burnt up the fields, destroyed the flocks and the herds, despoiled the villages, and laid waste to the fertile plain, and put many of the young men of the Church to the sword (see Jdt 2:27). What drove Saul to commit such evil acts against the holy ones? He worked hard to fulfill what he believed to be his calling. As he rode he mapped out in his head the logistics of his mission; the ancient Syrian city was to be the final conquest. Centuries of precedent empowered him. He belonged to the Jewish tradition of zeal for the law, like Phinehas, Elijah, and the Maccabees, a fanaticism that impelled him to obsessive study and practice of Mosaic Law and he acted out by persecuting the disciples. Pharisaic Judaism, the type Saul practiced, was rooted in this long-standing religious and academic tradition, and as he prepared for each raid—in his mind a matter of law enforcement—the high court’s top prosecutor referred to the scriptural and historical models of his heroes, the source of the fire burning within his uncircumcised heart. No one could stop me, he thought. He drove himself and his soldiers ever harder and hastened to reach Damascus by sunset. After eight days in their saddles the bodies of the riders hurt. They were somewhere on the edge of the desert when the city of Damascus came into view. In the distance could be seen the temple of Jupiter jutting above the city walls lined with ramparts at every corner. The snowy peaks of the Antilibanus mountain range stretched far north to Saul’s native Tarsus¾he could ride through the mountain pass all the way home if he wanted¾while he and his garrison plodded along the salt flats, fending off the urging of the mirages. Almost immediately the landscape grew plush with foliage and marshland where farmers with sharpened goads drove yokes of oxen through the loamy plains hemmed in by date, olive, and walnut trees, a veritable paradise, the garden of Eden that God gave man to care for and to cultivate. The verdant valley rushed far and away in every direction. The voice of the Spirit spoke the Word and renewing the face of the earth. This was man’s all (Eccl 12:13). Saul knew history as well as the Law. It was here upon the Damascus plain that the Assyrian general Holofernes, commissioned by King Nebuchadnezzar, waged war on the nations of the western world—including Tarsus—that withheld allegiance to the king. Nebuchadnezzar planned to take over the world, a master and lord of his life and of the lives of others. Holofernes marched through the plain of Damascus with legions of commanders and mounted archers. He fell not in battle but in his tent when God, who again freed his people from tyranny, sent the pious widow Judith to ply the general with wine. “Holofernes, charmed by her, drank a great quantity of wine, more than he had ever drunk on one single day in his life” (Jdt 12:20). Quite sodden with wine, he passed out on his bed. In the night Judith drew his sword from its scabbard and prayed to God, “‘Strengthen me this day, O God of Israel!’ Then with all her might she struck him twice on the neck and cut off his head. … She handed the head over to her maidservant, who put it in their food sack. Then, as was their custom, the two went off for prayer” (Jdt 13:6-10). Some warrior, this Holofernes! A great woman, this saintly Judith who dispatched the general by calling upon the power of the Lord! These are among the stories from the Old Testament that shaped the mind of Saul who fancied himself a great leader after the fashion of Alexander who gave Mediterranean region the Greek language, or Pompey, the first of the Caesars to ascend Mount Zion. In the final century before the birth of Christ, Marc Antony waited on Cleopatra at the mouth of the Cydnus, south of Tarsus, as she sailed into the harbor to offer herself as ransom for Egypt. Saul, even as a boy with a religious vocation, the son of the son of a Pharisee, wanted to become a hero, an emissary who bore a message for the world, an ambassador whose allegiance belonged the one, true, holy, and ever-living God. That desire drove him to savagery and violence. A great war Saul prepared to wage, but not the sort of battle he intended to fight. Soon his true mission would be made clear as the sun. He and his legion entered the final stages of their journey from Jerusalem. They all geared up for the final, decisive battle. But as they neared Damascus, a light from the sky suddenly flashed around them. Sunstroke! A mirage! In his mind Saul could not determine the source of the phenomenon and he grew delirious, felt as though he were drunk. The horse he was riding reared up and he pulled back on the reigns. 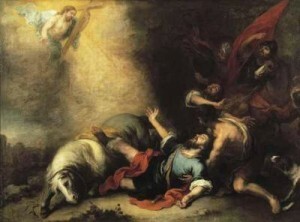 Saul tumbled from the saddle and hit the earth and the blow knocked the wind from his lungs. Horse and rider lay stunned. A vain hope for safety is the horse; despite its power it cannot save (Ps 76:6; 33:17). The words of the psalmist meant nothing to him as he lay powerless on the ground. I can’t get up. His mind raced. Are we being attacked? He looked to see his companions prostrate on the ground. Some saw the light; others heard the voice. Pagan soldiers bore no basis for understanding the encounter. “Cowards!” Saul cried. “Stand up and fight!” My picked men, they are useless to me now. The elements of creation collided–lightning struck, thunder clapped¾but a flock of pigeons filled the sky, flying in concentric circles then roosting on the wall. The Messenger dispatched his Word. A voice that Saul recognized (how he did not know) spoke to him in Hebrew, the language of his ancestors, the language of the Torah. It spoke to him without a sound, yet the truth of the Messenger struck to the heart. A light from the sky, a voice from heaven¾this Saul understood. He knew his Genesis, his Exodus, his Isaiah and Jeremiah and his First Kings. In his mind Saul was thinking, this isn’t an attack; this is the Great Theophany. Heaven and earth combined. Moses, Elijah, Isaiah, Jeremiah—there is a biblical basis for this encounter. I’ve heard this story before. The light faded. The voice ceased. Slowly the companions of Saul lifted themselves from the ground. They stood half-sacred, swords drawn, eyes wide pinned to the sky and bracing for another attack. They discussed what happened in knots. I saw the light but did not hear anything, some said. Others said that they heard the voice but did not see the man that spoke to Saul. What about Saul? What did he see? He lay motionless on the ground and they assumed he was dead. Chaos ensued among the ranks. What should we do? Take him back to Jerusalem, the captain of the guards said. No, he’s in no shape to ride, another officer claimed. Well, what then? Leave him for dead, another said. No! Saul cried. Finish the journey! Deliver me to the house of Judas on the Via Recta. Suppose he calls upon his God and his God protects him? We had better do as he says. They lifted him from the ground, and, step by step, led him by the hand past the checkpoint at the southern entrance to the city. Then the made their way through the colonnaded thoroughfare and dumped him off at the palace of Judas the synagogue leader in the center of the city. Everything was different now. Like Holofernes, Saul the conqueror had been conquered. How he knew not. But the operation that began in Jerusalem was over. Another mission had begun. The vision left him too weak not to comply. The words of the prophet Isaiah came to him. “In the scroll of the book it is written: ‘Here I am, Lord, I come to do your will’ ” (Is 40:7-8).